As winter finally comes to an end, many Hanover PA residents are ready for the warmer days of spring. While winter is typically known as the season of unsafe road conditions, spring brings its own concerns. In Pennsylvania, spring is well-known for rainy days, wind, and even random wildlife on the roads, all of which cause new driving challenges to be aware of. 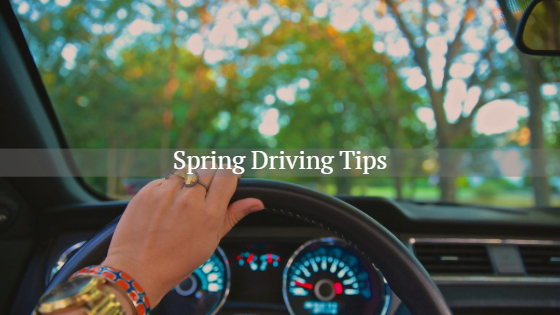 To help keep you safe on the road this spring, we’ve put together a list of tips to handle the various driving obstacles you may experience. If you find yourself driving in the rain, remember to keep your headlights on and use the windshield wipers when necessary. Depending on how severe the rainstorm is, drive slowly, especially if you can’t see more than a few feet in front of you. In any type of rain, brake with caution and keep at least two car lengths between your vehicle and the one in front of you. After a long winter break, motorcyclists are ready to spend some time on the road come spring. Staying alert for motorcycles is vital. Before switching lanes, check all mirrors and take a quick glance over your shoulder to confirm no motorcycles are riding in your blind spots. Don’t forget to always use the turn signal when you go to switch lanes to signal to those behind you what your plans are. Potholes are a common sight on roads after the winter has passed because of the freezing and thawing we experience in Pennsylvania. The defects in the roads are also dangerous for drivers, causing unwanted damage to vehicles. It is best to avoid potholes if possible. Be wary of puddles that may be hiding a pothole underneath. If you must drive over potholes or puddles, take it slow to avoid damage. Springtime usually means more people, pets, and kids outside. Kids and pets are unpredictable when it comes to determining which way they will move. Be cautious while driving in neighborhoods and main roads, always looking a few feet ahead to make sure nobody runs in front of the vehicle unexpectedly. For many, spring is a time of suffering from allergies causing an increased need for allergy medications. Some medications have adverse side effects. Be careful when taking medicine and avoid getting behind the wheel if it makes you dizzy or tired. Another unpredictable component in spring driving is wildlife. Many animals come out of hibernating including groundhogs and turtles. It is not unusual to see these animals near the road or in the middle of it. Proceed with caution and try to drive around the animal or stop until the route is clear. Protect yourself this spring with adequate auto insurance. Contact the team at Rumbaugh Insurance for a policy review today. Our insurance agency is located in Hanover PA but serves the neighboring communities.